Download forms and informative PDFs to aid you in your partnership with Career Employment Service, Inc.
Get a head start on the application process by filling out our downloadable pdf, so you can work on it at your own pace. Please be sure to bring the application along for your personal interview with us, or send it in an email, to , ahead of time. If you prefer, you may come in person and fill one out at our office. Policies for employees to follow are within this download. It discusses attendance, time sheets, checks, dress code, availability, and injuries. Downloadable weekly time sheet with an employee agreement, customer agreement, and submiting policy. We want everyone to stay safe while on the job, but we realize things happen. 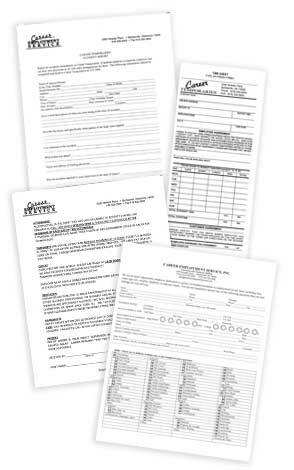 In case of an accident, report immediately to Career Employment and fill out this pdf form. This download contains basic knowledge for employers. It includes information about our screening process, hiring policies, and invoice payments.